Japanese golf-club manufacturer Miura Golf has quietly been making the worldâ€™s highest-quality forged irons for the worldâ€™s major golf OEMs for 41 years.Miura Golfâ€™s 64-year-old founder Katsuhiro Miura, whose forged clubmaking skills over the past 48 years have prompted the Japanese to claim he has â€œGodâ€™s hands,â€ founded the company when he was just 23 years old in Himeji, Japan. His company currently manufactures forged clubs primarily on an OEM basis for some of the worldâ€™s major golf-equipment companies. However, the company also makes and markets high-end clubs (iron sets start at $1,099) under the â€œMG Golfâ€ brand, which is marketed by Miura Giken Co. Ltd. in Japan, and â€œMiura,â€ which is marketed exclusively by Miura Golf Inc. in the United States, North America and the rest of the world. Bill Holowaty: My responsibilities vary but as a relatively young company in North America my role has been to build brand awareness. Bill Holowaty: I have always had a passion for golf. My start in the golf industry was a direct result of my yearly visits to the Miura factory which occurred while I was playing Profession Hockey in Japan. Mr Miura took the time to show (teach) me all about his business and his philosophy. His passion was contagious and after many visits to Himeji I knew that I would eventually end up working with the Miura family. Bill Holowaty: Although relatively new of the North American and European landscapes, Mr. Miura has been manufacturing forged golf clubs since 1957. Our focus has not changed. 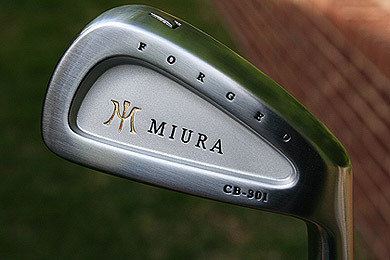 Mr. Miura builds golf clubs to â€œperform first and sell secondâ€. We realize that because the Miura process which does not lend itself to mass production, we are only able to produce a limited amount of irons in a given year. The Miura family will continue to focus on producing the absolute best forged irons with the plan to develop a greater presence within North America. Although Mr. Miura believes the good golfer will find him, we are working hard to build the brand awareness. Bill Holowaty: The perception of most within the golf industry would be that only the better player benefits from forged irons. Certainly that is where the majority of our sales come from. However, Mr. Miura believes that the only true â€œgame improvementâ€ club is one which is able to give you feed back on your miss hits. That would be a forged iron. 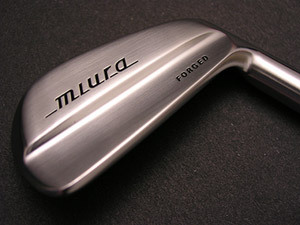 That said, Mr. Miura believes all golfers would benefit from playing forged irons. Although our bread and butter is the Tournament Blade and the CB 202 and CB 301 models, we do offer a very popular mid sized cavity back, the MC 102, which fits the â€œeyeâ€ of many more golfers. 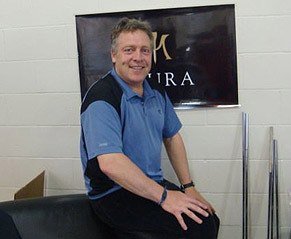 Bill Holowaty: Please go to the Miura Golf website for the current product lines. 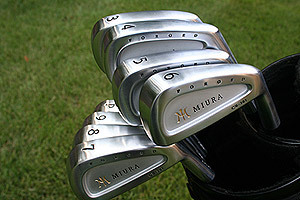 www.miuragolf.com. Bill Holowaty: We pride ourselves in stretching the limits of golf shaft performance by exploiting our knowledge of composite structures and design. E2G: What kind of technology do you have that sets you apart from your competition? Bill Holowaty: We donâ€™t like to compare ourselves to other companies. Mr. Miura believes if he continues to produce to his own high standard, that is all he can do. In terms of our products, the grain structure within all Miura heads is among the tightest in the industry. That is what is ultimately responsible for the renowned Miura feel and performance. Mr. Miura has in the past done work on behalf of the some of the largest equipment companies in the world which is testament to the quality of his work. Bill Holowaty: A forged iron allows the skill of the individual golfer to be realized. Whether it we hitting a partial shot, curving shot, low shot or high shot, a forged iron allows the golfer to do that. The consistency of the grain structure within the head means more consistent shots. The â€œepiphanyâ€ golfers experience after hitting a ball with a Miura forging is what all golfers are searching for. Bill Holowaty: There is a Mr. Miura. He still occupies the number one chair on the grinding line. The legacy of the company is intact with Mr. Miuraâ€™s two sons intimately involved in the business. Yoshitakaâ€™s fast growing reputation as a craftsman is being fostered by his work with touring professionals in Japan and abroad. Bill Holowaty: Our dealer network is expanding weekly. Detailed listings can be accessed from our website. We are working with custom club fitters and some green grass accounts. We want to identify the best in the business and believe that the Miura â€œshingleâ€ will separate our dealers from their competition. Bill Holowaty: We would hope so. The traditional nature of forged irons helps to enhance the skill levels of golfers. By maintaining our integrity we believe we will always be true to the game. Bill Holowaty: We really believe that as the industry continues to search for the next wave of technology, they will be left with something that does not resemble the traditional values associated with the game. Bigger, odd shapes and new materials take us further away from what we truly love about the game of golf. Not a 350 yard drive but rather a 158 yard shot to a flag tucked just over a bunker. Bill Holowaty: I do not think they can hurt the everyday player. We are all inspired by how easy they make it look. We believe that there is a misconception that everyday player can access the same equipment they see on TV. Miura produces tour quality equipment which is available to the everyday golfer. That is something which is exciting.